A skate shop I frequent has these in stock. Seems pretty close to the coyote design. Been waiting to see another option , especiall better design in the UPPER and boot liner. Yes frame looks similar and solid. Price is a lot better than even than the Coyotes 1998 price! Just cracked the buckle on my other Coyote today! Thanks. As I haven't been able to find a pair of Terrablades for sale (anywhere) this might just be the ticket. You may want to call or email Thuro and ask Dave (he will be the one who gets the email) if they don't make your size or if they just don't have your size. He's pretty accommodating when able. He doesn't discount but you can tell him Brian (who rides the Carver trucks) referred you if you want. Everyone in the store is friendly and knowledgeable. you can buy just frames to mount to your own boot(not sure how difficult to do ) if you can't find your size in whole boot.. 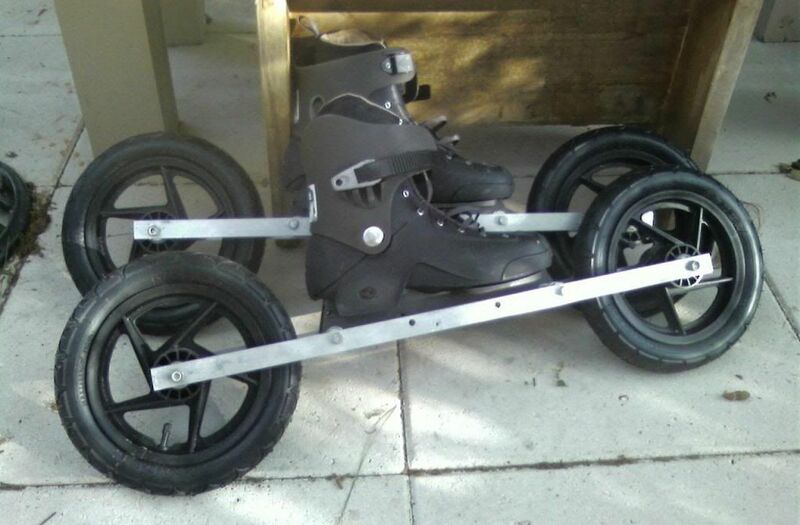 These most recent threads about off-road skates pushed me over the edge! I just ordered some yesterday. They look to be an awesome cross-over for snowkiting. I used to do a ton of ice skating and even some road work with four-wheel speed skates back in the day so I'm thinking the learning curve won't be too bad. Yes, helmet, knee and elbow guards, small, non-lifty kite and a grass field to start! Shockingly, my wife was really pissed (again). Did you buy the ones with the long wheel base I see in the link? I personally FAR prefer the short 3 wheel base like Coyotes. The shorter wheel base makes for much smaller turns + allows me to walk / run out a bad situation. The long wheel base makes getting around even more clumsy. I agree that Coyote style blades are about as close to kite skiing as you can get. You will not be 'carving' w/ these at all like you can with the their Metropolis Model..... or like Coyotes. Not just turning, but even just skating movement(push and glide, with or without kite) will be more clumsy. You may want to consider changing your order to Metropolis SUV model if you want more of ski/skate/ freestyle experience- and considering your background(ski/skate). Cheaper $ to make wife less pissed...uhhh..perhaps! Bladerunner and skimwashington - thanks for the advice. I have updated my order and will go with the Metropolis SUV models instead. The website I ordered them from does have the Eu47 size. The first few places I looked at only had them up to 46 which is too small for my feet. I fear even the 47s will be "snug". I started my search yesterday with the Metropolis SUVs in mind but then got away from them with the size thing. They do look awesome and I really look forward to flying around with them! Thanks again guys; saved (again) from myself by my PKF family! I'm super curious how this turns out. 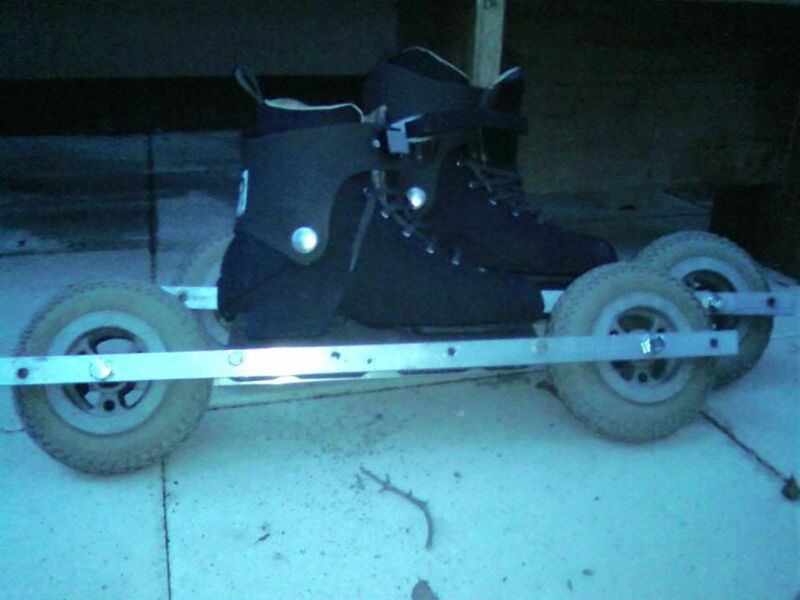 The SUV rail kit will fit my current skate boots, making it just bolt on, so sizing won't be an issue. Looking forward to a review/opinion on how they are to use! Curious? That makes two of us Volock! Temps are forecasted to not get out of the 30's all week with snow in the forecast up here in the Wasatch range so my days could be numbered to get these bad boys on my feet on some fields before Winter blows in. Course that means snowkiting season starts! What I'm sayin is it may be May before I really give these skates the time on my feet they deserve and for what merits a proper review. I get down to Albuquerque a few times a year for business. Maybe I'll bring my gear down with me sometime and we could get a skate-kite session in. That would be a blast! I'm hoping it's not May, so I know if I need to buy myself a pair! We have access to a giant grass field to use here most the year (minus September/October... namely Albuquerque Balloon Fiesta Park) and a few other places to go when that's crowded. The local ampitheater/concert venues asphalt is a little rough, but can be a ton of fun on short lines. 70's then high 50's for me this week, so when the wind blows I'll probably get out for the first time. Just got cleared to fly again, provided I'm harnessed in and not flying unhooked/FB on handles, from my recent arm injury. 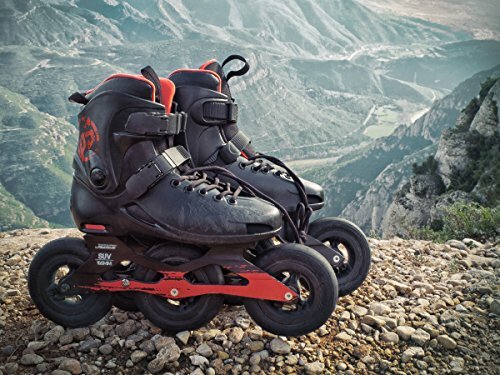 My real debate is whether to put the money out for these which may not work well, or continue waiting for TerraBlades to come up, and grab them, as I know from my inline skates (and speed skates before I broke one), that I really enjoy the kite skating thing. I will be at Thuro this Thursday or Friday picking up my new board. If anyone wants me to check out anything in particular about the Metropolis SUVs, while I'm there, let me know. -Chances of Terrablades coming available are less than slim. - One site selling the Metropolis SUV claims they run small and actually highlights under size choice('please order 1 to 1 1/2 sizes larger'(in EU sizing)* on the item order page. Well...you can always get just the frames for your own boots-those that would accept the frame mounting. I am trying to get a 2nd opinion from another shop on their sizing. You would be best to ask. If I find out anymore I'll update. Maybe they know at B-Roc's shop...? * sizing conversion charts are notoriously erroneous and variable for conversions. I'd say 80-90% are innacurate-not throughout their chart necessarily, but at certain size points. BTW....1 EU size advance equals ~.75 US size advance. The way I see it I will move the boots between the 3-wheel SUV frames and the longer 2-wheel Path frames depending on what I want to do. I do plan to use these for conditioning in addition to kiting and I think the two types will have unique applications. On a side note, the folks at proskaterplace are great to work with. They offer a "points system" that amounts to discounts on future orders. I bought the SUVs as one order and the Path Frames as a separate, second order, applying the discount from the first order to the second! Highly excited to open up another fun way to motor around under my kites!!! The shorter 3 wheel ( 4 wheel for terrablade ) blades make carving turns MUCH MUCH better. Almost like carving a turn on skis. When you are in motion and hit a full stop, Sand traps etc., you can sort of step / run out the situation. ( or end up flat on your face quicker than you can react ) . The smaller wheels seem to limit my top speeds.. The longer 2 wheel style offer more stability in a straight line when being pulled by the kite. Turns need to be Hooj, or step turns. Trying to get around on your own is very clumsy. Adding larger wheels will increase your top end speeds. The longer the wheel base the more likely you are to bust a leg! Nothing beats having both to see what style works for you. If I had both I wold go 2 wheel when trying to go faster than 40mph.. 3wheel for free ride. Coyotes tended to run a bit small on size as well. I am very pleased to see a new option out there for blades! To me they are the perfect cross over to summer if kite skiing is your #1 passion. I come from a skate / ski background and when I tried the Coyotes there was nobody to advise me. I was over the top with joy when I tried them and found them so kite ski like ! Even in our relatively rough park. On hard pack sand and dry lakes they are amazing fun! TIP : I drag my toe wheel to check speed going into a turn. etc. . A habit that I have to watch myself with. I end up wanting to do it on skis. I know. I've had trouble getting ahold of him over his pair he posted on sale here/about getting a new custom pair made for me. It's a pipedream I realize is unlikely to come true. That formula makes no sense in my experience... I think you forgot a 3 in front of the .75. The way I see it I will move the boots between the 3-wheel SUV frames and the longer 2-wheel Path frames depending on what I want to do. Sounds like an awesome plan. I'd think it should work well. It'll be interesting to hear how they are on grass/dirt (my biggest concern) as when I demo-ed a pair of Nordic Skates, they needed smooth enough of both, I wasn't convinced they'd be kiteable enough for what I wanted to buy a pair. these look like decent coyote replacements. prepared surface/relatively smooth pack dirt or sand/ short firm grass/trail. the tire width just makes a world of difference, ATB style tire or larger really opens more terrain choice. the best combo i have used is a doom wheel set with ATB (8"or 9") set to limits of boot. fun, agile, jump tolerant and plenty fast! heres the doom set with 12"
platform IS HIGH! frigtheningly fast.